Ariana Grande Opens Up About Her Relationship With Justin Bieber! Even since Ariana Grande went on tour with Justin Bieber, she's been dealing with rumor after rumor about her relationship with the pop superstar. Everyone thought they were more than friends after she posted a picture of Justin kissing her, and since then their fans have been wondering just how close they really are — and we have the answer! 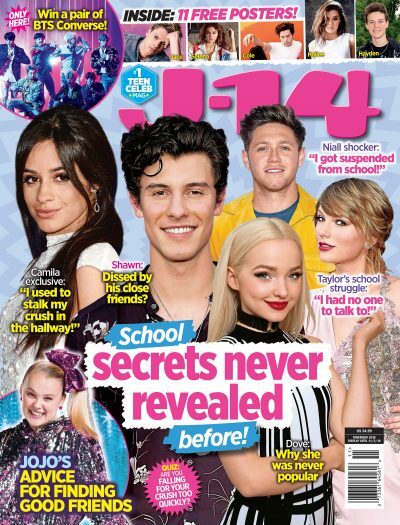 In J-14's EXCLUSIVE interview with Ariana, she let us know exactly where they stand, and her answer might surprise you. "It’s funny — everybody thinks we spent so much time together because we were touring, but really, I think I saw him once, and it was for about five minutes," Ariana said. "He played me ‘Heartbreaker,' it was amazing, and then I left. It’s like ‘hey, great job, bye.'" Ariana admits that with both of them performing, it's basically impossible to be together at the same time. "You don't really see each other, cause it's like I'm on stage, then I'm off stage, and then I leave and I go to sleep. And then he's on stage then he leaves," Ariana said. "So it’s like you don't see each other." Even though she didn't get much face-to-face time with the Biebs, she definitely thinks his Beliebers are going to be happy with his new album, saying, "I did get to hear some of his new music, and it’s amazing. I think his fans are going to be so pleased. It’s next level, it’s amazing, and it sounds great." Are you surprised that Ariana and Justin barely saw each other? Comment below!